Carolina Assadi (carolina.assadi@oceansnell.com). © Carolina Assadi (carolina.assadi@oceansnell.com). Published in: Balech, E. (1990). Four new Dinoflagellates. Helgoländer Meeresuntersuchungen 44(3-4): 387-396, 50 figs. 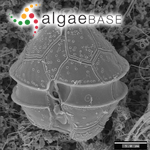 Type locality: Italy: Gulf of Salerno, Tyrrhenian Sea (Silva 1996-to date). Notes: Iconotype: cell: Balech, 1990: figs 12-18; cyst: Montresot et al., 1993: figs 7-15. D'Onofrio, G., Marino, D., Bianco, L., Busico, E. & Montresor, M. (1999). 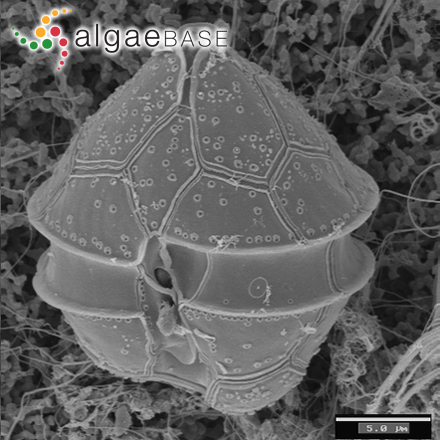 Toward an assessment on the taxonomy of dinoflagellates that produce calcareous cysts (Calciodinelloideae, Dinophyceae): a morphological and molecular approach. Journal of Phycology 35(5): 1063-1078, 45 figs, 4 tables. Montresor, M., Zingone, A. & Marino, D. (1993). The calcareous resting cyst of Pentapharsodinium tyrrhenicum comb. nov. (Dinophyceae). Journal of Phycology 29(2): 223 -230, 25 figs.